In order to meet the requirements of thermal barrier inspection applications on primary pumps devised for nuclear power plants, a phased array transducer has been specially designed. It implements innovative solutions. The aim is to use focusing and electronic deflection to scan the whole potential defect area in the best possible resolution conditions, while simplifying as much as possible the mechanical motions of the probe that will be installed in a difficulty accessible area. The sensor especially uses an original active part that is shaped so as to focus through a very pronounced toric interface as well as a wedge in elastomer material, allowing outstanding coupling with the part to be inspected and easier implementation. Thanks to their acoustical and mechanical properties Piezo-composite materials are the basis of this multi-element transducer. Several thermal fatigue cracks appeared on some thermal barriers of primary pumps of 900 MW nuclear pressurised light water reactor, and Electricite de France (EDF) decided to define a global maintenance strategy. The defects had to be detected and sized from the cylinder-torus interface in a narrow space between flange and motor bearing (see figure 1). The feasibility study has shown that ultrasonic inspection with the hydraulics remaining in place was possible, without removing the impeller and the whole bearing and gaskets. In this stage, materials, accessibility and shape of the flange, single crystal transducers as well as phased arrays were taken into account and tested. The zone to be inspected is of austenitic forged materials and can also includes anisotropic parties which can generate some dispersion on the echo-dynamic curves. The flange material is an austenitic forged steel with good homogeneity. But due to the heavy thickness we have observed on some components a local anisotropy than can modify the propagation of ultrasonic waves and need different echo-dynamic curves. Considering the features of this inspection, a phased array transducer has been developed by IMASONIC. The necessary radial sweep q (see figure 2) for the inspection is electronically performed with a Phased Array transducer. In this way, we obtain a scanning angle that is larger than with mechanical scanning, while simplifying the complex mechanical device to be positioned in the available space. Circumferential scanning f is a mechanical scanning process. The Phased Array technique also offers the possibility to focus at different depths for the detection of defects in different areas (see figure 1). Better steering of the beam can also compensate some effects due to the anisotropy of materials. The phased array probe is designed including a piezocomposite material. The structure of these materials, illustrated on figure 6, is made up of thin ceramic rods (which present a mechanical continuity following one dimension of the space) embedded into a polymer matrix (which presents a mechanical continuity following three dimensions of the space). Used as plates and equipped of electrodes on their main sides, these materials have many advantages compared to piezo-electrical transducers generally used in the field of Non Destructive Testing. Beyond the properties and characteristics described in table 1 below, piezo-composite materials feature mechanical properties that allow them to be shaped so as to generate focused ultrasonic beams or allowing them to withstand high mechanical or thermal constraints. The various performance results shown above are used for designing and manufacturing the phased array probe that is described below. The phased array probe has had to be designed to take into account various performance objectives and a certain number of constraints. The defects to be detected and sized are located at approximately 200 mm from the area that is accessible to the probe. A crack must be detected systematically if it is longer than 5 mm in the radial plane of the flange, and it must extend up to at least 20 mm (more if possible) with a 5-mm accuracy. Taking into account the sound path and the materials to be inspected (austenitic forged materials), a maximum operating frequency of 2 MHz is defined. At this frequency, and given that little space is available for the probe, the largest possible active part should be used to reach the resolution objectives. In addition, as the inspection operation will be done through a toric interface with a highly defocusing effect (r=50mm & R=400mm), an aspheric active part should be used, that was made up for this purpose. The probe uses an active part with approximate dimensions of 50x55 mm, that mechanically focuses through the toric interface at a depth of 200 mm and axially at 20 mm from the starting point of the cracks to be detected (see figure 4). In such conditions, the simulated lateral resolution is 13 mm in the radial plane and 15 mm in the circumferential plane. The defect scanning area, in good conditions, spreads up to 40 mm from their starting point. The piezo-composite technology used has been used to directly shape the active part. Given the distance between the probe and the defects, in a material that does not facilitate the transmission of ultrasounds, it is essential that maximum energy be transmitted from the probe to the part to be inspected. This energy is maximised at various levels. The electro-acoustical efficiency of the probe itself has been maximised thanks to the performance level of the piezo-composite material selected and the electrical adaptation of impedance, that could be built into the probe's body. The power transmission has also been studied by maximising the coupling solution on the part to be inspected. For this purpose, the probe incorporates a wedge in soft elastomer material that perfectly matches the toric profile of the inspection area. In addition, this material has an acoustical impedance that is close to that of water, which reduces the influence of potential thickness irregularities on the water film between the wedge and the part. The high electroacoustical output of the active piezo-composite part helps to obtain the good signal-to-noise ratio that is required for inspection. To restrict as much as possible the structure noise resulting from the materials to be inspected, the probe's damping has also been maximised in order to reduce the length of emitted impulses as much as possible. Given the electronic environment in which the probe should be built, the number of elements has been set to 16. As the active part should the widest possible so as to reach the lateral resolution objectives, its size has dictated the inter-element pitch dimension. Given the operating frequency, the environment to be inspected and the probe's inter-element pitch, we could anticipate the presence of grating lobes in the part to be inspected. In order restrict as much as possible the level of these lobes and reach the electronic deflection objectives in good conditions, the probe was designed so as to have the widest possible bandwidth. 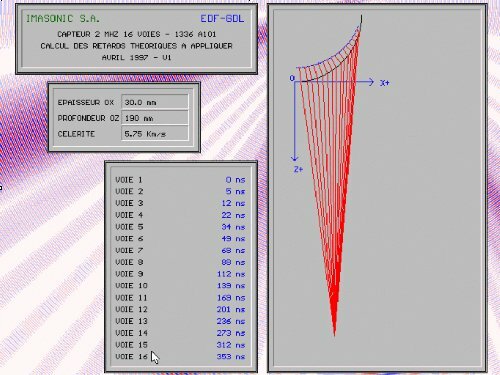 As the active part geometry is complex, a software program was developed with the probe in order to calculate the delay laws required for the electronic steering of the probe. In order to validate the coherence between the sensor's inherent performance and the performance level that was simulated during the design stage, it has been characterised element by element in a first stage. The centre frequency, bandwidth and pulse length were measured in emission/reception on a infinite plane target in water. The inter-element coupling and impedance were measured using a network analyser. The beam profile is quasi-cylindrical. At the mechanical focal distance, i.e. 200 m, the lateral resolution is: 12 x 13 mm. At the acoustical focal distance, measured at 170 mm, the lateral resolution is: 11 x 12 mm. The sensor being then steered with the appropriate delay laws, all defects that were looked for could be detected. Its implementation and use without mechanical scanning turned out to be fast and easy. The results obtained were satisfactory and are coherent with simulations. The targeted improvements for the next probes concern signal-to-noise ratio and lateral resolution to size smaller defects. A second inspection technique is also considered with Symmetrical Tandem TOFD. E.Abittan, EDF GDL. A. Dochy, Jeumont Industries. T.Allart, Framatome. H Malletguy,CTE Nordest. "Ultrasonic Inspection of the primary pump thermal barrier flange". ECNDT CongresS, May 1998.